宋姝庭, 孙丽, 蒋金凤, 黄海, 王建华. 基于实时荧光定量监测逆转录病毒MuLV/Friend感染方法的建立与评价[J]. 中国药理学通报, 2018, 34(8): 1175-1178. SONG Shu-ting, SUN Li, JIANG Jin-feng, HUANG Hai, WANG Jian-hua. Establishment and validation of real-time quantitative reverse transcription PCR assay for detecting replication dynamics of MuLV/Friend in mice[J]. Chinese Pharmacological Bulletin, 2018, 34(8): 1175-1178. Abstract: Aim To establish the real-time quantitative reverse transcriptase PCR (qRT-PCR)-based approach for quantifying the replication dynamics of MuLV/Friend in vivo. Methods The genome RNA from MuLV/Friend was extracted and reverse transcribed into cDNA; gag DNA was amplified and then linked into PMD-19T vector to build a standard substance, the specific fluorescent probe against gag was synthesized, and the standard curve of gag DNA was established by qRT-PCR quantification; BALB/c mice were infected via intraperitoneal injection with MuLV/Friend, and the viral replication dynamics in multiple tissues was quantified by qRT-PCR. Results The qRT-PCR approach was established to quantify MuLV/Friend replication in mice. The approach was effective, faster and sensitive to monitor the dynamics of viral replication in multiple tissues of infected mice, and would facilitate the use of the MuLV/Friend-infected mouse model in the studies of host antiviral immune responses and the development of antiviral strategies. Conclusion T The established qRT-PCR approach in this study has higher sensitivity for detecting viral particles, which may improve the traditional method for detecting viral replication by calculating the index of splenomegaly. 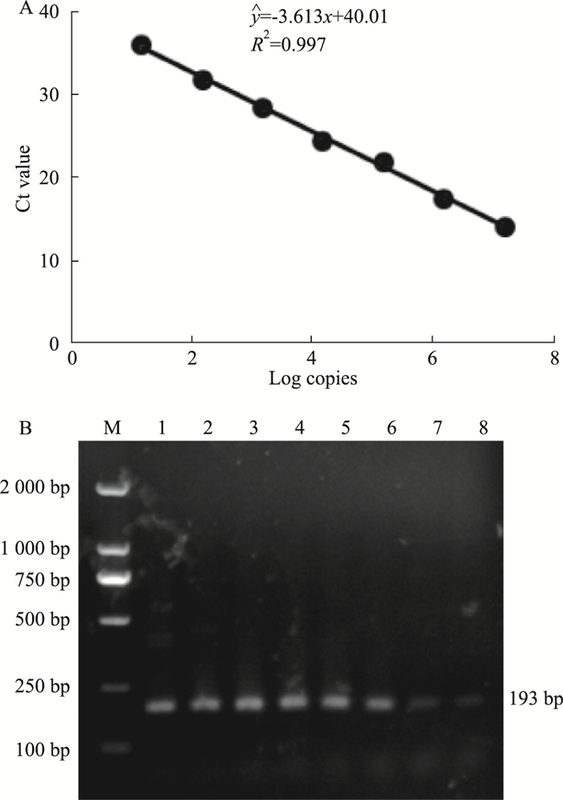 Fig 1 Establishment of standard curve for real-time quantitative reverse transcription PCR assay A:A standard curve was established using multiple diluted gag standard substances; B:Amplified gag DNA bands were detected by agarose electrophoresis. M:Marker; Lane1-7:The serial dilution of standard substances from 10-4 to 10-10; 8:The negative control, using water as the template for RT-PCR. Fig 2 Viral distribution in tissues(n=8) BALB/c mice were infected via i.p. with MuLV/Friend for 14 d, and the splenomegaly was observed (A). a:mock (PBS) infection; b:virus infection. Viral loads in multiple tissues were quantified (B). Fig 3 Dynamic kinetics of virus replicationin blood and spleen(x±s, n=3) Viral loads in blood and spleen were quantified at the indicated time of post-infection. Ney P A, D'Andrea A D. Friend erythroleukemia revisited[J]. Blood, 2000, 96(12): 3675-80. Kabat D. Molecular biology of Friend viral erythroleukemia[J]. Curr Top Microbiol Immunol, 1989, 148: 1-42. Ahlers N, Hunt N, Just U, et al. Selectable retrovirus vectors encoding Friend virus gp55 or erythropoietin induce polycythemia with different phenotypic expression and disease progression[J]. J Virol, 1994, 68(11): 7235-43. Tambourin P, Wendling F, Moreau-Gachelin F. Friend leukemia as a multiple-step disease[J]. Blood Cells, 1981, 7(1): 133-44. Chinese Pharmacological Bulletin, 2018, 34(8): 1175-1178.